Why is Cost Difficult to Determine? If you tried to call the dentist to ask for a price on dental implants, chances are you didn’t get a straight answer. Dentists do not want to give patients an exact number before they see them because they have no idea what the extent of their tooth loss actually is. They could also require additional treatments before placement is viable, only further increasing the overall cost. That’s why the best way is to always have the consultation first. You may be surprised by what you learn and what options you have, even if you want to replace several teeth at a time. First and foremost, you’ll need to determine exactly how many implants will be needed to replace your missing teeth. Keep in mind that when we talk about implants, we’re only referring to the titanium rod that integrates with your bone. This piece does not include the restoration or the abutment that connects them together. You’ll discuss what the implants are made of and what to expect from surgery. On average, dental implants can cost anywhere from $1,800 to $2,500, depending on the manufacturer. The abutment is what connects the permanent restoration to the implant itself. It is crucial to ensuring the crown has a stable foundation, especially as it undergoes consistent pressure from chewing and grinding. The abutment itself will average between $300 and $500. The restoration is far more complicated because the price largely fluctuates based on its complexity. For example, single implant-retained crowns can cost between $1,000 and $3,000, but implant bridges can cost as much as $3,000 and several thousands of dollars more. These are complex restorations designed to function for decades at a time, so they need to be built well to last. In some cases, you may need what is called a bone graft to place implants. Bone grafts use donated bone, either from other parts of the body or from medical facilities, to expand and reshape existing natural jawbone. Using synthetic bone is cheaper, typically between $250 and $1100. Using your own bone cost more and can range from $2,000 to $3,000. The treatment for placement itself can also vary due to the cost of sedation, which is necessary for surgery. 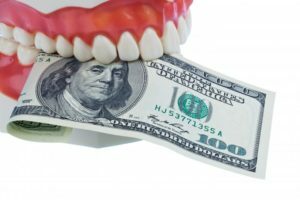 While implants can get expensive, you won’t know the final cost until you actually speak with a dentist on the subject. Schedule an appointment today to learn more about your treatment! Dr. Leslie Metzger earned her dental degree from the Ohio State University College of Dentistry. After attending many continuing education courses at the Las Vegas Institute for Advanced Dental Studies, she’s able to provide high-quality restorations after your implant has fully healed. To learn more about her practice, you can contact her through her website.